« We’re net positive for 2013! Q4 2013 summary: 10% cooler, 22% more usage and 10% more sun as compared to Q4 2012. In Q4 last year our total usage was 1,599 kWh. This year is was 1,957 kWh, a 22% increase. Despite snow covering the collectors for a few days and cloudy weather, we still produced 10% more energy in Q4. Overall, here’s how this quarter and the year compare to 2012. We used 22% more energy (358 kWh) this quarter as compared to 2012. That’s about 3.8 kWh extra per day, or 158 watt hours per day more than last year. The last two quarters we’re been running 4 to 5 kWh higher per day. Last quarter I predicted this quarter usage would also likely be up 4-5 kWh/day from Q4 2012. It looks like we stuck to the lower bound, same as last quarter. One noticeable difference this quarter was our heat usage. Q4 2012 our air-source heat pump used 205 kWh. This quarter we used 438 kWh, a 114% increase. It was about 10% cooler than Q4 2012, but we also had 10% more sun. It’s not really clear to me at the moment what is causing the increased usage. I’ll have to do a bit more detective work. Overall for the year we would have paid $180 to heat and cool our house, if we paid for electricity. Water-wise our usage is down 5%, and our hot water usage is down 13% from Q4 2012. 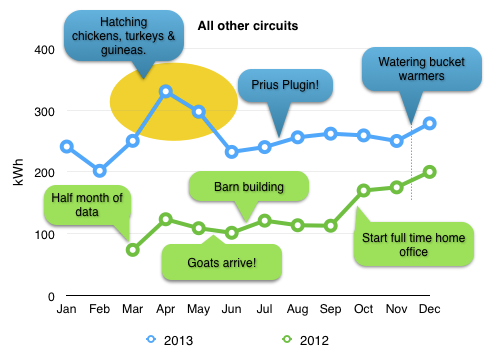 Looking back over 2012 and 2013, most circuits we track stay about the same over time, excluding heat. The one set of circuits that have changed a lot over the last two years are in the category of ‘all other circuits’, meaning the circuits we do not measure individually. This category counted for 43% of our overall usage in 2013. This includes plug loads, lighting and ventilation. (Ventilation is only used from late fall through mid spring.) Plug loads include the home office, the TV, stereo, refrigerator, freezer, coffee maker, incubators and heat lamps for chickens in the spring, the Prius plugin, barn lights, electric fence, water bucket warmers, etc. You can see that this category has steadily grown from 100 kWh/month to peaking in April at 330 kWh/month. I’m hoping we’ve leveled off, averaging around 250 kWh/mo. We will still have a peak in the hatching season, until the chickens take over this work for us.